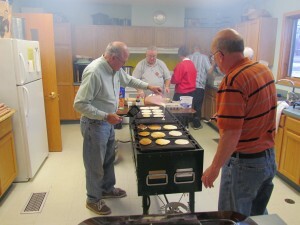 Our Community Christmas Breakfast was held on December 8th. It was our 27th year. Over 200 people attended. This is at least 50 people more than last year. We had much joy and fun working this event. People just kept coming in the door. The Bake Sale had many prize baked goodies and the Silent Auction had many great gifts for Christmas giving. The African Duka (store) sold many articles which helped the income of our breakfast. The Raffle was great and thanks to the Agoye Family for donating the Cash drawing back to our Brothers and Sisters in Africa. Audry Orf and Scott Hults won the table linens and doll made and donated by Jacky Hansen. We made $3200.00 plus $1200.00 matching funds from Thrivent Financial for our Ifunda Congregation. We will purchase lap tops to take next year, fund our ag project for 2013 and still have some seed money to begin financing a Micro Finance Bank for our companion congregation. It was just a joy to be there. The cooks, dishwashers, setup crew, take down crew, snow scoopers, Santa, Santa Picture taker, Silent Auction workers, African Duka shop keeper, Baked good bakers, Silent Auction contributors, and ALL who helped, “WE SAY THANK YOU” for making this the successful event it was. God is surely blessing our “HOUSE OF PRAYER”. As chair and sub-chair people of this event we say thanks to You! This entry was posted in Home Page News, Tanzania. Bookmark the permalink.